"LeadBI is a lead generation software application that uncovers information about your website visitors and turns them into leads." LeadBI include dozens of functionality to convert your visitors into leads! LeadBI’s B2B lead generation tool identifies anonymous website visitors even if they do not leave any contact information. Many B2B businesses use some sort of analytics tracking. However, these tools do not show who your visitors are. LeadBI is engineered to show you the identity of the visitors on your website. Not only do we tell you their company name, we also supply you with their business contact details and even pinpoint the pages they are viewing so you can see exactly what each company is interested in. All of this data is supplied to you in real-time so you can watch as your visitor browses your site and prepare yourself to contact them to close deals with them. LeadBI scored 70/100 in the Marketing Automation category. This is based on user satisfaction (85/100), press buzz (25/100), recent user trends (falling), and other relevant information on LeadBI gathered from around the web. LeadBI is a lead generation and marketing automation software solution designed for small- to medium-sized businesses, large enterprises, digital agencies and resellers that want to improve their online marketing strategies and get real leads that can then be transformed into real paying customers. This is a platform that helps users to uncover useful information about visitors to their website and provides them with tools that facilitate a smooth and easy transition from casual site visitors into real workable leads. 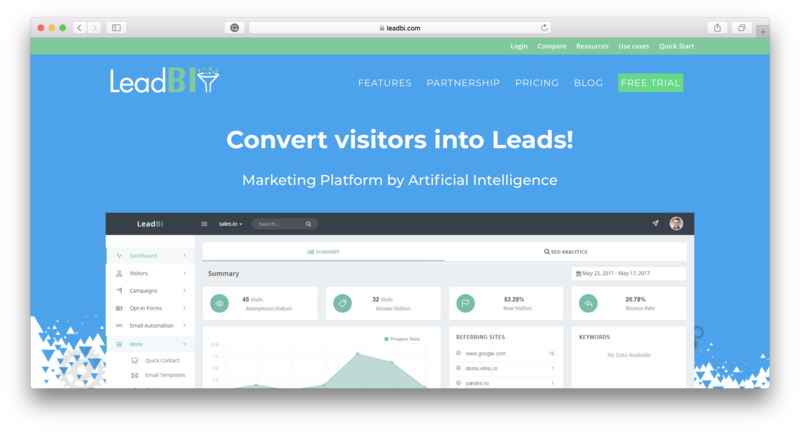 The LeadBI marketing automation platform provides businesses and agencies the ability to discover and maximize data from their website visitors so they can be turned into highly valuable leads. The software solution is packed with a myriad of features designed to ensure faster and more accurate real-time detection of customers, maximize return on investment (ROI) and filter leads so they can focus only on those who have a high probability for conversion. In short, LeadBI marketing automation software solution helps marketing professionals, agencies and businesses of all sizes to identify, monitor, nurture and convert real leads. With LeadBI’s wide range of features and capabilities, users have the ability to find and identify anonymous website visitors with relative precision. They can collect crucial data regarding the visitors, from the company name and contact information all the way to visitor behavior and patterns while they’re on the website. LeadBI is also designed to allow businesses and marketing professionals to accurately gauge and identify different marketing channels that have the potential to drive more traffic to their websites and social media pages and convert leads into sales. The software solution is a feature-rich and robust platform that comes with a wide range of features and functionalities to help users become more effective and efficient marketers and sales teams more successful in winning over loyal customers and marketing their products and/or services. With LeadBI marketing automation software solution, you have the ability to effectively track anonymous visitors to your website. Check and analyze site visitors with ease, even before they become potential leads. The platform provides you with advanced tools and complete visits control, allowing you to observe every action taken by unknown visitors without the need for them to fill up any forms while browsing your site. Once those anonymous visitors become known, the leads maintain the actions’ chronology and the lead score, so all you have to do is assess the lead itinerary inside your website. Marketing automation is right at the core of the LeadBI platform—one of the most crucial features, in fact. By utilizing LeadBI’s full capabilities, which include the said feature, you are able to send crucial emails to your target customers with split second timing. Essentially, the platform gives you the ability to send emails only when the prospect is all good and ready to be contacted. With this feature, you can send welcome emails, add tags and propose special offers when the lead is showing interest by visiting several times to one of your pages. The marketing automation feature also comes with a workflow builder tool that allows you to create a customized route to drive contact and turn casual visitors into satisfied customers. With LeadBI’s email campaign functionality, you are able to keep track of all your contacts with ease and efficiency. Regardless of which platform or system you used to acquire the email addresses and other contact information, you can easily import the contact list CSV to LeadBI and maintain a solid database of email list for future marketing campaigns. You can easily create new email templates using the tools available to you from LeadBI and send them out to your contact list. With this function, you have the capability to start tracking all your previously acquired leads instantly, without any valuable time wasted. You may also incorporate LeadBI acquired leads into your existing list and initiate your campaign with a more far-reaching audience. Obviously, if you have the ability to create, automate and initiate web marketing campaigns then you should also have the capability to keep track and monitor each one of them. That is what campaign tracking is for. With LeadBI’s web marketing integration, users have the ability to track and analyze advertising clicks, regardless of the time interval of each of your campaigns. LeadBI is designed to integrate seamlessly with your existing web marketing campaigns so you don’t have to stop or completely abandon previously launched campaigns, even if they are months apart. A platform’s ability to integrate seamlessly with existing software solutions is crucial to the functionality and usefulness of that particular platform. This is what LeadBI marketing automation software solution is all about. It is designed to easily integrate with tools and solutions your marketing and sales team might already be using. LeadBI has customer relationship management (CRM) and email marketing integrations available, so you don’t have to worry about crucial data being lost, process efficiency and so on. With this platform, you simply have to upload your visitors to the CRM you are currently using or add them to your email marketing software. LeadBI can integrate with Salesforce, Pipedrive and more with just a single click. Obviously, there are a lot more features and functionalities available with the LeadBI marketing automation platform, such as the form and popup builder, one-to-one emails, the ability to profile companies, reporting and analytics, leadscore, alerts, WordPress plug-in, Chrome extension, API and a wide variety of email templates. LeadBI provides users the ability to identify anonymous visitors to their website and figure out selling opportunities for their business in real-time. The platform comes with proprietary technology that is capable of detecting every action and interaction conducted by every site visitor. As a result, the solution enables users to see what each visitor is doing and learn what they are looking for in your website. This gives businesses the ability to tailor a specific sales and marketing approach that has better chances of converting that casual visitor into a satisfied customer. With LeadBI marketing automation software solution, you are able to take all of your efforts and focus only on real leads that have great potential for conversion. You don’t have to waste your time and effort on each and every lead, hoping that they all pan out. This way, you can maximize your advertising return on investment (ROI) and focus more on actual customers who want to do business with you. LeadBI allows you to empower your sales team by giving them the right tools and capabilities that allow them to create the best pitch for potential partnerships. Your sales reps can look at which website pages each individual company has visited in the past, allowing them to understand each prospect’s current technology profile as well as look into the history of their website visits. LeadBI offers two enterprise pricing plans for you to choose from. One is completely free and comes with a wide array of features and tools, while the other is a paid subscription. Pricing is based on the number of contacts you currently have. They also offer a free trial, an on-boarding package, dedicated account manager and automation workflow. All priced differently. A 15% discount is available for annual billing. The on-boarding package is priced starting from €595, the account manager starts at €250 per month, while automation workflow is available starting at €200. Free migration is also offered. Should you consider LeadBI as your marketing automation platform? Based on its features, capabilities and effectiveness on delivering what it is designed to do, checking out the software solution might be worth your while, especially if you’re looking for reliable and highly functional marketing automation software. Does LeadBI integrate with any other apps? Yes you can integrate LeadBI with CRM and your email marketing software. What is LeadBI generally used for? LeadBI is a lead generation software application that uncovers information about your website visitors and turns them into leads. LeadBI’s B2B lead generation tool identifies anonymous website visitors even if they do not leave any contact information. Does LeadBI offer multi-user capability (e.g. teams)? Yes we have a special plan and a dashboard just for agencies and for the entire team. Does LeadBI offer an API? Does LeadBI offer guides, tutorials and or customer support? We offer total support with live chat, call and demo. Who are the main user groups of LeadBI? What platforms does LeadBI support? 4.27/5 based on 6 user ratings. What do you like about LeadBI? LeadBI is an all-around platform, it includes lots of features to help me with marketing: from direct emails and advertising campaign tracking to advanced marketing automation workflows. It also includes one of the best Drag&Drop Form Builder I have ever seen. This platform also includes a Drag&Drop Email Builder, which speeded up my work a lot. I first used Drip, but there's no way to compare it with LeadBI. LeadBI has more features and works better. Also the LeadBI customer support is amazing, they helped me with the initial platform configuration and answered all my questions in short time. What do you dislike about LeadBI? LeadBI is a fresh startup, thus they make a big release almost every month and it's a bit difficult to keep up with all the new features. At least, we receive periodical newsletter about new features and their knowledge base is always up to date. What have you been using it for and what problems did LeadBI solve? I've been using LeadBI to segment all my visitors and send them only customized emails. This boosted my click-to-open rate and lowered the bounce-rate. LeadBI also helped me re-engaging cold leads, some of them even became recurring customers.